Hamilton is a British electrical products and solutions provider that designs, develops and manufactures innovative electrical products of the highest quality. With a vast product range spanning circuit protection, wiring accessories, smart lighting control and multi room audio. Hamilton is a one stop shop for wiring requirements in a wide range of applications. A family-owned and run company, Hamilton exists thanks to Rod Hamilton’s vision and determination and celebrates a fantastic milestone this year as the business reaches its 50th anniversary. and has grown since its inception to employ over 100 customer-focused staff and distribute its class-leading solutions around the world. all supported by exceptional customer service. 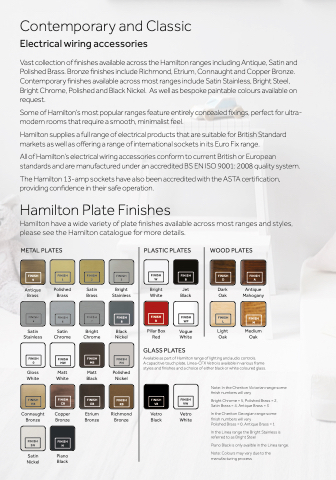 As an industry-leading company, Hamilton is ceaseless in its quest to produce pioneering solutions that are easy to install, competitively priced and have a stylish, desirable finish suited to any interior project. “Hamilton exists thanks to Rod Hamilton’s vision and determination.